How successfully do you communicate with someone different than yourself? What are your ways of managing disagreements and conflicts? How to direct communication in desired direction? 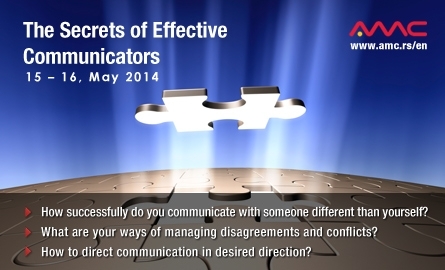 Would you like to learn secrets of effective communicators? The training helped me to open up new horizons, to understand my previous behavior and my view of the world. New tools have given me the opportunity to understand better situations and persons and to refine my senses that I did not pay attention. Action NLP techniques encourage optimism moving personal limits and wishes up to greater congruence between internal dialogue and external behavior. I expanded my knowledge of other people, the way of communication and understanding of different situations in my life. Gordana Berger is a woman whose example I follow in every aspect of my life. Talks with her give me strength, and her advices make my fate in myself stronger. This is how I felt as well when I was attending Action NLP training. In my point of view as I have worked in retail sales where the audio communication is primary the revelation is the visual communication, and obviously the keys of eye communication.